Orecchiette with Pesto. Almond-Rye Cookies — always with butter. Orecchiette with Rough Chopped Arugula-Walnut Pesto. 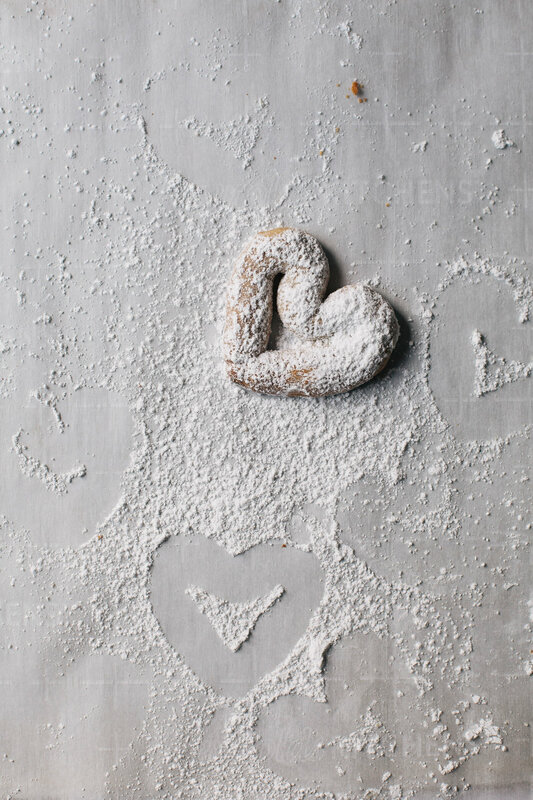 almond-rye heart cookies. Fall is finally here, after it seemed like waiting an extra month or two. 93 degrees in October? We were all ready to be able to be able to throw on a sweater or actual enjoy being under the covers at night. Well it has finally come and I’m enjoying being in the kitchen more and more. A bit of a chill outside really wants me to be standing by a warm over or waiting for a pot of water to boil. That emanating heat is the best. individual ingredients in it. Wafting scents of warm Barilla® Collezione pasta filling the air, dinner was really in just a few minutes. Just my style. Dessert was of course a necessity, cookies this time around. These cookies are short and crumbly, with the rye flavor really standing out to make them unique. One of my new favorites. I used Reynolds Kitchens™ Parchment Paper with SmartGrid® which was helpful in more way than one in this recipe. I generally have a problem with doing something by eye, not measuring or weighing and making it all the exact same. They all start out looking somewhat similar then just go off the deep end and look nothing like they are supposed to. The Reynolds Kitchens™ Parchment Paper has a grid already laid out on it. So when I was to roll out the dough to 7 inch long pieces, I couldn’t find a ruler anywhere so I cut a little strip of parchment and used that as a ruler making each piece 3 squares long. Then when shaping into hearts each one was to fill one grid square, couldn’t be simpler than that. A proper Sunday dinner complete, now time to snuggle up with the kitty and watch a good movie. On a large cutting board, roughly chop with arugula and walnuts then place in large serving bowl. Add in the pecorino and toss together. In a separate bowl, whisk together the garlic, lemon zest, lemon juice and olive oil until combined. Pour over the arugula mix and stir until coated. Keep in refrigerator until pasta is ready. In a large pot, bring 4-6 quarts of water to a boil, then add salt to taste. 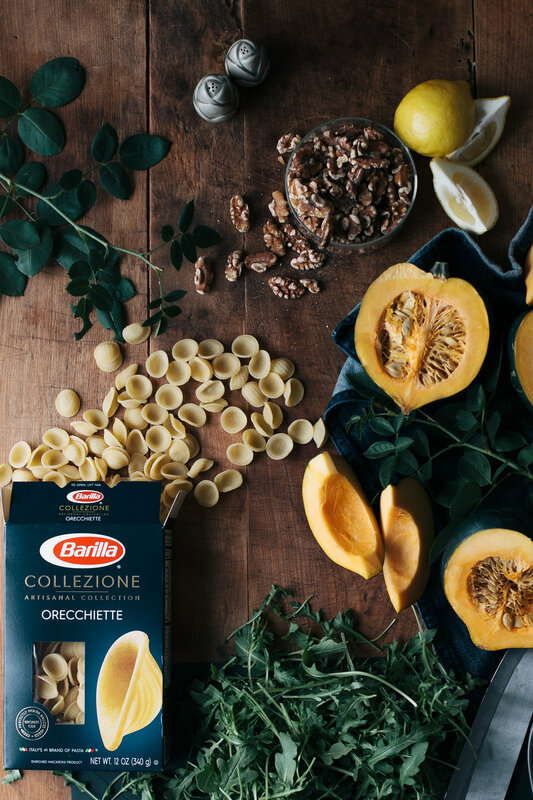 Add in the Barilla® Collezione Orecchiette to the boiling water. Boil for 12 minutes, stirring for ‘al dente’ pasta. Add another minute if you like it a bit more tender. Drain from water and add into the bowl of pesto. Toss to coat. Serve immediately. Cut each acorn squash in half and remove the seeds*. Then slice each half into quarters and place skin side down on a baking sheet or large baking dish. Drizzle the olive oil over and generously sprinkle with salt and pepper. Place in oven and roast until tender. Serve warm. *seeds can be roasted off too, just clean them and toast them in the oven for a few minutes once the squash is done. In a food processor, pulse almonds and both flour until nuts are finely ground. Add salt and cinnamon, pulse to combine. In a bowl, with an electric mixer, beat together butter and sugar on medium until smooth and fluffy, about 2 minutes. Add egg yolk and almond extract, and beat until combined. With mixer on low, gradually beat in flour mixture until just combined. Preheat oven to 350F. Roll tablespoon-size portions of dough into 1/4 inch thick ropes, each about 7 inches long. 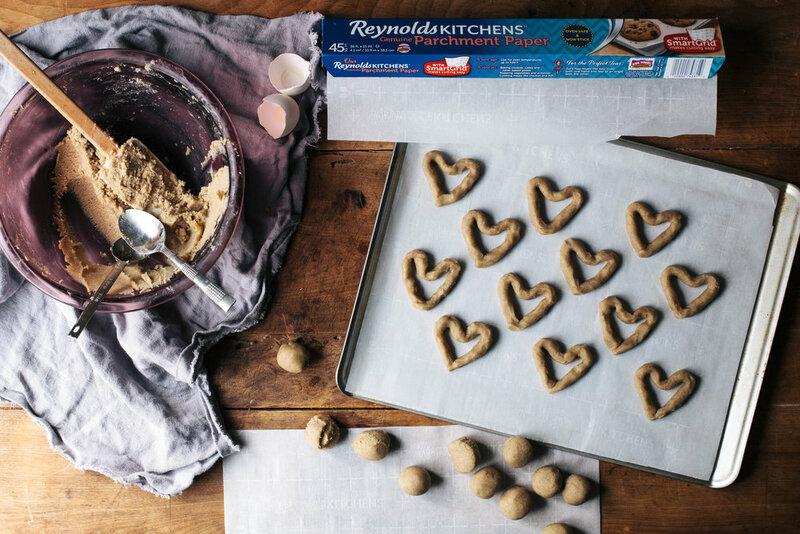 Transfer to a baking sheet lined with Reynolds Kitchens™ Parchment Paper with SmartGrid® and shape into hearts. Refrigerate until firm, about 10 minutes. Bake, rotating sheets halfway through, until cookies are golden brown and crisp, about 17 minutes. Transfer sheets to wire racks and let cookies cool completely. Dust with powdered sugar just before serving.